Religious people should support equality for gays and lesbians not despite religion — but because of it. 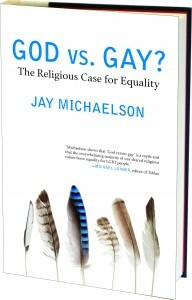 So writes Jay Michaelson in his new bestselling book God vs. Gay? The Religious Case for Equality, which Publisher’s Weekly called “a salvo in the case for equality” and which was recently #1 in gay/lesbian nonfiction on Amazon.com. Contrary to the myth that the Bible prohibits homosexuality (the myth of “God versus gay”), Michaelson shows how the handful of Biblical verses sometimes used against LGBT people are ambiguous, and subject to interpretation. The real question, he says, is not “what about Leviticus?” but what values cause us to choose one interpretation or another, and how we as human beings grow when we encounter other people. In this text-based and no-holds-barred discussion, Michaelson discusses his own personal journey of acceptance and affirmation, and how the overwhelming majority of our religious values support inclusion of LGBT people. Plenty of time will be allowed for questions and conversation.